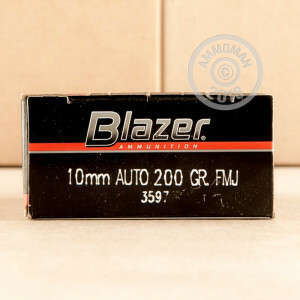 Because it is made by Blazer, this 10mm cartridge sports a shiny new heat treated aircraft grade aluminum casing. Such a casing is less than one third as heavy as a comparable brass one, so you’re bound to notice that this case of ammo is significantly lighter than what you’re accustomed to hauling around. Aluminum is also a lot less expensive to produce than brass, so this cartridge represents significant savings without compromising performance. The major downside to this casing is that it isn’t reloadable, but for those who eschew the reloading bench there’s little reason not to save a few bucks with this ammo. This round sports a 200 grain projectile made by Speer. 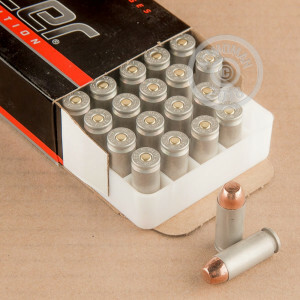 The bullet’s full metal jacket will keep your pistol’s bore unfouled by lead during your shooting session, so you can enjoy firing more accurate shots before copper fouling necessitates that clean your weapon. This round also features a CCI primer, which is both reliable and non-corrosive.